The thrill of adventure and Walt Disney's love of classic journey storytelling is at the heart of the inaugural release from the brand new studio effort--Walt Disney Animation Collection: Classic Short Films, Volume 1. 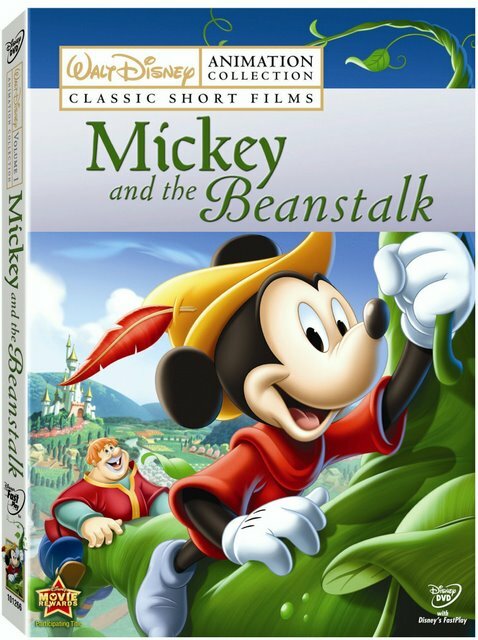 With the classic Mickey and the Beanstalk (the 1947 version) as the headliner that opens the fast-play equipped disc, we're treated once again to the roughly thirty minute Disney-fied version of the Jack and the Beanstalk story that inserts Mickey, Pluto, and Goofy into the familiar tale. While it still remains a classic, the transfer of the image is startlingly poor which is a noticeable flaw from the otherwise superior offerings of the typically perfectionist minded studio. As it's available throughout numerous other releases-- along with some of the other shorts contained on the disc-- namely The Brave Little Tailor, Gulliver Mickey, Thru the Mirror, and Mr. Mouse Takes a Trip, it's up to Disney collectors and fans as to whether or not you'd prefer to go for this affordably priced (but technically average) presentation or move to a more in-depth set of the famous shorts. My hope is that ultimately the studio will use the same care to painstakingly restore these vintage shorts with the same love, attention to detail, and obsession they grant to their feature length works and that hopefully some of the noticeable tears or scratches in the celluloid transfers, hisses on the soundtrack, dirt and grain in the image will be cleaned up for a Blu-ray collection and preserved for future generations. Yet, as it stands, for fans who don't have the time, film geek interest or budget to begin hunting down the notoriously limited time only Walt Disney Treasures numbered collectible offerings or pricier sets and would just like to take a trip along with Mr. Mouse, you'll find yourself instantly delighted by this series. While some of the transfers in the series are far superior (Three Little Pigs for example was extremely clear), the Mickey and the Beanstalk story is a House of Mouse staple and fans will adore the collectible litho print animated movie still included in every box. However, be sure you take in the bonus shorts like Disney's Mickey-centric replacement for Gulliver's Travels in Gulliver Mickey as they tackle the Lilliputians in a 1934 black and white short before the critically acclaimed feature length version by a Disney competitor via Max Fleischer's Gulliver's Travels was released in 1939. Additionally, the true delight among these shorts was the Alice in Wonderland-esque, technically dazzling and creatively audacious Thru the Mirror that won't fail to charm and is quite a find for those who have yet to discover it.